Put all the ingredients into a food processor and blend until it becomes a sticky ball. 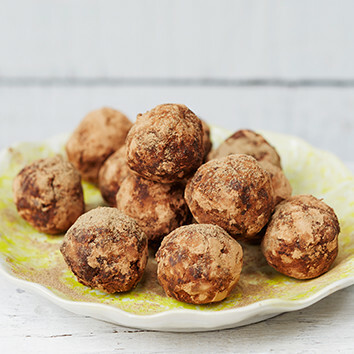 Form into 10-12 balls the size of a ping pong ball and then dip into some more Supergreens Cacao Boost powder. Put into the fridge for 1 hour to set. Leave in fridge until you want to eat them, they will keep in an air tight container for approximately 10 days.